iTunes uses QuickTime for audio playback. QuickTime and iTunes often default to using Direct Sound, which may lead to sound distortion during playback. To correct this problem, you need to tell QuickTime to use “Safe Mode” (waveOut only) as the playback device. Open QuickTime via Start, Programs, QuickTime, QuickTime Player. 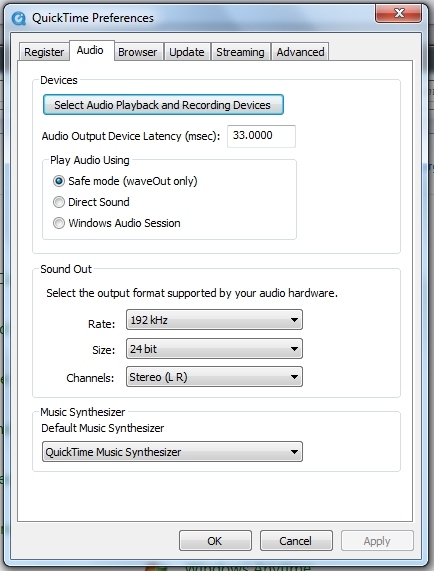 For QuickTime 7, click on the Audio tab. Under Devices, click to select Safe mode (waveOut only) and click on Apply. Click the Select Audio Playback and Recording Devices button to open your windows audio control panel. Set both devices to match the name of your sound card. Click OK.
Click OK in the QuickTime settings, then close QuickTime. More recommendations can be found on Benchmark’s guide for configuring Windows-based media players. Considerations about (24-bit/192kHz) playback formats can be found in the ‘24/192 Music Downloads‘ article. Keep in mind that Airplay only transmits at 16/44.1. Posted by bioss at 9:48 pm on June 19th, 2009.